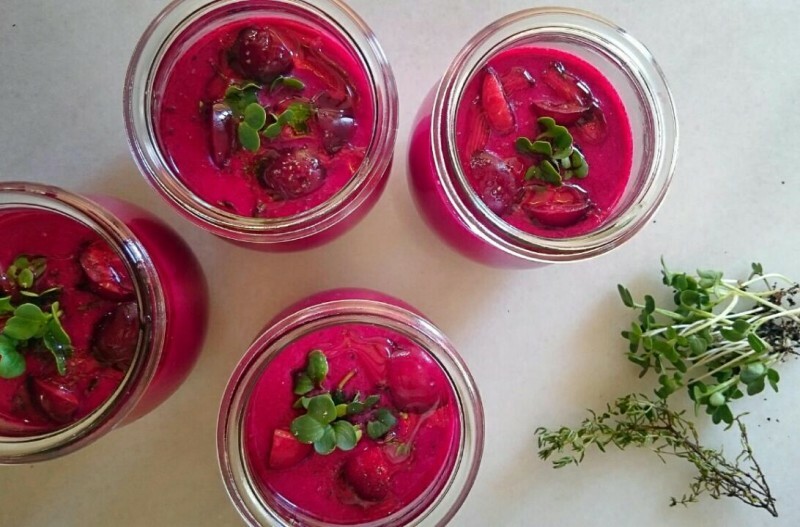 Detox beet&cherry gazpacho with thyme. Now it really looks like the summer has already started. The temperatures have started to go up and the body needs also some sort of freshness. We can find this freshness in all the seasonal products and also in the way of cooking them, or should I say in the way of not cooking them…For me it is the season where eating is easier. Anything natural and fresh can make up a salad or a soup, and fresh fruits can be a wonderful snack…. Who wouldn´t live in summer with just “gazpacho”, watermelon or melon? And what a coincidence that this way of enjoying fresh vegetables or fruits (without the need of doing anything else!) happens in the summer season! What a synchronicity! Everything gets easier and we should be really thankful for that! Today´s recipe wasn´t going to be something depurative, blood-cleanser or detox. I usually let myself go with whatever I see in the market and that is why my mind associates different flavours. But this time when I thought about the nutritional properties of the dish, it turned out that the main three ingredients were really good body cleansers! Bingo! And besides, as we eat them raw, these properties stay intact. The beetroot is one of the vegetables that better cleans the body, especially because it helps clean the blood from toxins and fat deposits, at the same time that strengthen the red globules. It is also very important its depurative work of the liver and vesicle and its lubricant capacity at the intestinal level. 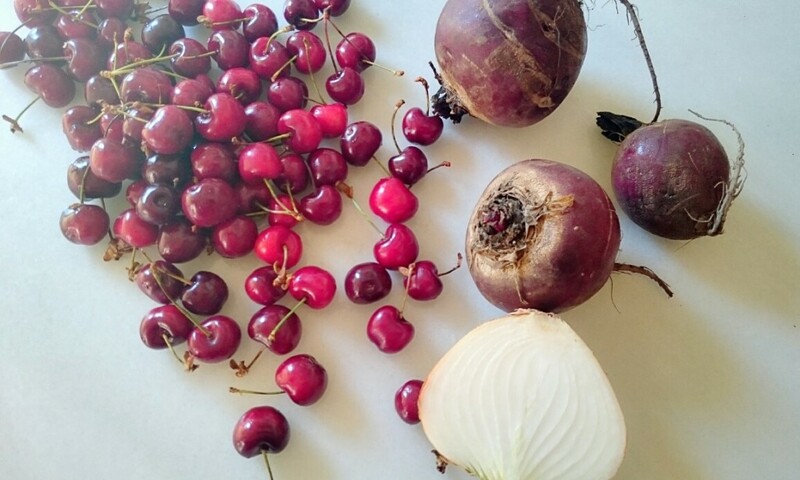 On the other side, the cherries have a big amount of magnesium and iron thanks to its maroon color (the same as the beetroot), which help stimulate and clean the digestive system, the liver and the blood. It also has the capacity to eliminate the excess of acidity in the body, what reinforces its properties against the rheumatism and the arthritis. And what to say about the onion which is pure medicine in vein: antiseptic, diuretic, expectorant, carminative, anti-cancer, antibiotic and a good blood cleanser. Its sulfur content helps eliminate the putrefaction and fermentation in the intestinal tract, removing heavy metals and parasites. This recipe has it all: taste and also helps regenerate your body! Although the thought of pitting cherries could stop you from continuing with the recipe, don´t even think about that, with a knife you will be done in just 10 minutes, and if you have a de-bonding knife will be even quicker. I advise you to grate the beetroot so the crushing gets easier but that would depend on the power of your machine. As an alternative I would propose to replace the cherries with any other red fruit or with strawberries, or with a mix of both of them, and I would also recommend putting a quarter of a cut avocado in each glass when you are ready to serve it. Pit the cherries with a knife or a de-boning knife. Save 6 units for the final decoration. Mix the beetroot and the cherries in a high powered blender with the rest of the ingredients, except 2 tbsp of olive oil. Whenever you see that it is starting to get a smooth texture, add the rest of the oil and mix all together one time more. Let it cool down in the fridge. When you are ready to serve it, stir well and distribute it in small glasses or bowls. Decorate with the cherries previously cuted into sections, the sprouts and some small leaves of thyme, a little bit of oil and a turn of pepper grinder.